In our 2018 issue, out Oct. 21, T celebrates six people who have inspired us to forge a different world of our own. Each of them has created something singular, be it a performance or an aesthetic, and they have all, in some way, helped steer the cultural discourse. And then there’s Viggo Mortensen. A man who can — at his very best — assume a certain density on the screen, who is somehow able to project a sense of vast interiority with just the flicker of his eyes or the nod of his chin. His face is strangely feline in its geometry, heart shaped, the sharp lines of his cheekbones framing his blue eyes. Even when he is covered in dirt or sweat or blood (or sometimes all three), he’s still in possession of a dignity that few other actors can rival. He is Hollywood’s most appealing man probably because he is Hollywood’s least threatening man. He is paternal but not patronizing; he possesses strength without aggression. Even in his most violent scenes, the tension builds but Mortensen rarely acts on it until necessary — like a judo master, he seems able to take another’s energy and flip it to his advantage. You desire him, but he doesn’t set out to seduce. The more he began to tell me about Lip, and about spending time with Lip’s family — of his day spent trekking up to a neighborhood in the Bronx that was once almost entirely Italian-American, or of making Lip’s family members laugh or cry after he had captured what was quintessentially Tony — he transformed before me. There, a spread of tapas between us, Mortensen’s shoulders hunched forward. His hands suddenly gestured in a different way than before. He spoke in a broad, New York accent. In that moment, I knew it was Mortensen, but I believed he was Tony or Nick or Tony’s brother. There’s lots more. Don’t miss it. You can read the article online at the NY Times website. p.s. The photos by Jackie Nickerson are great. I particularly like the combination of clothing (this is, after all, Style magazine). In the first image, he is wearing a $1340 jacket, a $98 T-shirt, and “Mortensen’s own sneakers.” In the second, a $6500 Canali coat, $1495 Armani pants, and “Mortensen’s own T-shirt.” I never imagined people would spend $6500 on a black trench-like coat, but it does look good with the T-shirt. 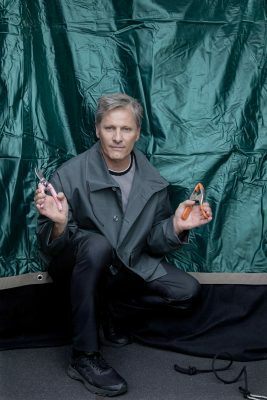 Of course everything looks good on Viggo.